Makes 4 servings, 2 enchiladas each. PREHEAT oven to 350F. Heat large skillet sprayed with cooking spray on medium heat. Add onions and garlic; cook and stir 2 min. Add chicken, 1/4 cup of the salsa, cream cheese, cilantro and cumin; mix well. Cook until heated through, stirring occasionally. Add 1/2 cup of the shredded cheese; mix well. SPOON about 1/3 cup of the chicken mixture onto each tortilla; roll up. Place, seam-side down, in 13x9-inch baking dish sprayed with cooking spray; top with remaining 3/4 cup salsa and remaining 1/2 cup shredded cheese. MY TWEAKS: If you're a daring cook or don't care about following recipes to a T, here's some tweaks you can try. 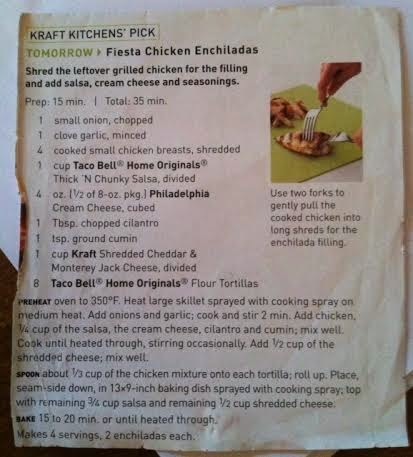 First off, the main components are chicken, cumin, cheese, salsa, cream cheese and tortillas. The rest is added flavor, so if you don't have everything, don't panic. *add-ins: peas and hashbrowns. I'd say frozen of each (plain hashbrowns), but make sure they are mostly thawed when making the enchiladas. Add them at the point you add the chicken, cheese, etc. *meat options: you can use canned, grilled, baked or fried, it all depends on the taste you like. I baked mine tonight using canned chicken (lazy) and my husband picked buffalo flavored chicken and I picked grilled, so I had to make 2 separate batches. *cheese options: the original recipe calls for cheddar & monterey jack, but it really doesn't matter much. I usually use taco or Mexican cheese.